Copyright LET provided by the copyright holder for use in the Cotton Town digitisation project. With less than 100 days to the UK General Election and with the majority of today’s politicians being indistinguishable both from each other or from wallpaper, what better time to recall and celebrate the redoubtable Barbara Castle. Barbara Castle was the youngest of three children, born and brought up in Yorkshire. Barbara grew up in a politically active and socially aware home, and joined the Labour Party as a teenager. Her sister was a pioneer of the Inner London Education Authority, her brother worked with Oxfam in Nigeria, her father edited a socialist newspaper and her mother ran a soup-kitchen for the town’s miners. Barbara excelled at school, was appointed Head Girl, and graduated in Philosophy, Politics and Economics from at St Hugh’s College. While at Oxford Barbara continued her interest in socialist politics, serving as the Treasurer of the Oxford University Labour Club. She entered the Cabinet as the first Minister for Overseas Development, becoming only the fourth woman in British history to hold Cabinet office; as Minister of Transport she introduced the breathalyser, made permanent the 70 mph speed limit and passed legislation to ensure that all new cars had to be fitted with seat-belts. 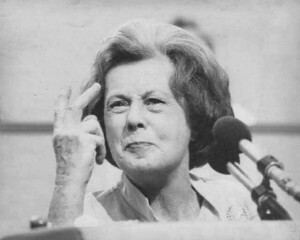 The institute of alcohol estimates that Barbara Castle’s laws may have saved up to 62 000 lives. As Secretary of State for Employment she courted controversy when the trade unions rebelled against her proposals to reduce their powers in her 1969 white paper, ‘In Place of Strife’. The introduction of the white paper, which would have curbed workers’ rights to strike, almost ruined her career, and almost brought down the Wilson government. Barbara Castle intervened to dramatic effect in the Ford sewing machinists strike of 1968, later celebrated in the film “Made in Dagenham”. The machinists, all women at the Ford factory in Dagenham, went on strike to support their claim to the same pay as their male counterparts. Not only did she help resolve the strike, not getting exactly equivalent salary but getting the women up to 92% of the pay men received, she went on to pass the Equal Pay Act. She never saw the fact that she was a woman as being important in her decisions to promote women’s rights. It was her belief that everybody deserved an equal chance, regardless of gender or race which inspired her to fight for reforms in the law. When Barbara was born women did not have the vote but by the end of the 1960’s she was one of the four most powerful people in the country. She was commemorated on a postage stamp issued as part of the Royal Mail’s “Women of Distinction” series for piloting the Equal Pay Act through parliament. As Secretary of State for Social Services she introduced a wide range of innovative welfare reforms, including the introduction of the mobility allowance, the Invalid Care Allowance and the linking of most social security benefits to earnings rather than prices. Never one to retire quietly, less than a month after leaving Westminster and despite her previously Eurosceptic stance, she stood for and was elected to the European Parliament Member as MEP for Greater Manchester North and served for the next ten years. In 1990 she took a seat in the House of Lords, as Baroness Castle of Blackburn. Barbara Castle died at her home in Buckinghamshire on 3rd May 2002.